caring companies that use their privileged position to help their colleagues, communities, customers, the environment and the less fortunate. 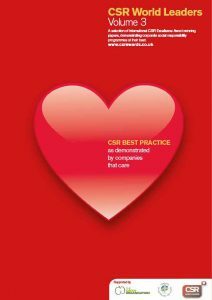 information so that others can learn and follow the lead of our CSR World Leaders. We thank them on behalf of all the other companies around the world who will benefit from their generosity. in PDF format click HERE. LATE ENTRIES MUST CLOSE MAY 31!